Constellation Sagitta the Arrow, is a northern constellation sitting above constellation Aquila and south of constellation Cygnus. 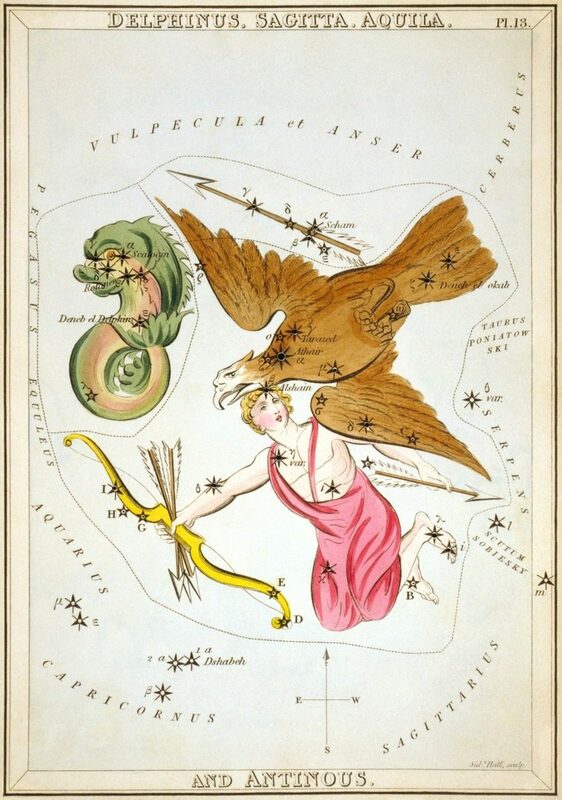 Sagitta spans 8 degrees of the Zodiac in the Sign of Aquarius, and contains 1 named fixed star. Sagitta represents the arrow with which Hercules slew the eagle (Aquila) that fed upon the liver of Prometheus. 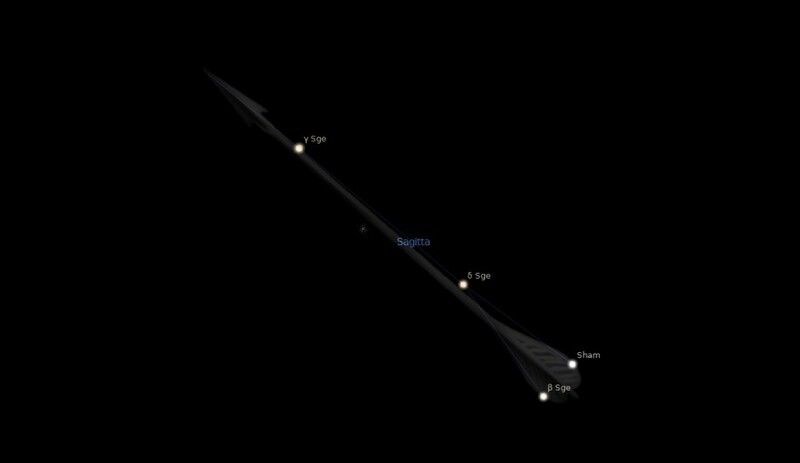 Sagitta, the Arrow, lies in the Milky Way, directly north of Aquila and south of Cygnus, pointing eastward; and, although ancient, is insignificant, for it has no star larger than the 4th magnitude, and none that is named. It has occasionally been drawn as held in the Eagle’s (Aquila) talons, for the bird was armor-bearer to Jove; but Eratosthenes described it separately, as Aratos had done, and as it now is on our maps. It has been regarded as the traditional weapon that slew the eagle of Jove, or the one shot by Hercules towards the adjacent Stymphalian birds, and still lying between them, whence the title Herculea; but Eratosthenes claimed it as the arrow with which Apollo exterminated the Cyclopes; and it sometimes was the Arrow of Cupid. The Hyginus of 1488 showed it overlying a bow; indeed, Eratosthenes called it toxon, a Bow, signifying Arrows in its plural form; Aratos mentioned it as the Feathered Arrow and the Well-shaped Dart, the allos oistos, of our motto, “another arrow,” in distinction from that of Sagittarius. Still, it has often been thought of as the latter’s weapon strayed from its owner. Hipparchos and Ptolemy had plain oistos. Sagitta, The Arrow, will bestow the skill of hurling the javelin with the arm, of shooting the arrow from the string and missiles from rods, and of hitting a bird on the wing in the sky that is its home or piercing with three-pronged spear the fish that deemed itself so safe. What constellation or nativity should I rather have given Teucer? To what degree should I prefer to assign Philoctetes? His bow enabled Teucer to repel the flaming torches of Hector which threatened to pour fell fire upon a thousand ships (Those of the Greeks at Troy). Carrying in his quiver the fate of Troy and the Trojan War, Philoctetes, who tarried in exile, proved a foe more potent than an armored host. 1. Fixed Stars and Constellations in Astrology, Vivian E. Robson, 1923, p.59. 2. Fixed Stars and Judicial Astrology, George Noonan, 1990. 3. Star Names: Their Lore and Meaning, Richard H. Allen, 1889, p.349-350. 4. Astronomica, Manilius, 1st century AD, book 5, p.235. 5. The Witness of the Stars, E. W. Bullinger, 17. Sagitta (the Arrow).